Late last year, ticket broker ScoreBig and Southwest Airlines ran a promotion offering customers 2,000 Southwest Rapid Rewards points and up to 22 points per dollar for purchasing tickets through the service. This week, the brand launched a new partnership with JetBlue that offers bonus TrueBlue points if you’re enrolled in both programs. In addition to the points you’ll earn for purchasing event tickets, TrueBlue members can earn an additional 500 bonus TrueBlue points after the first transaction. You can earn up to 4 points per dollar on Islanders tickets with this new promotion by JetBlue and ScoreBig. The total earnings will ultimately depend on which event you’re attending and which seats you select. 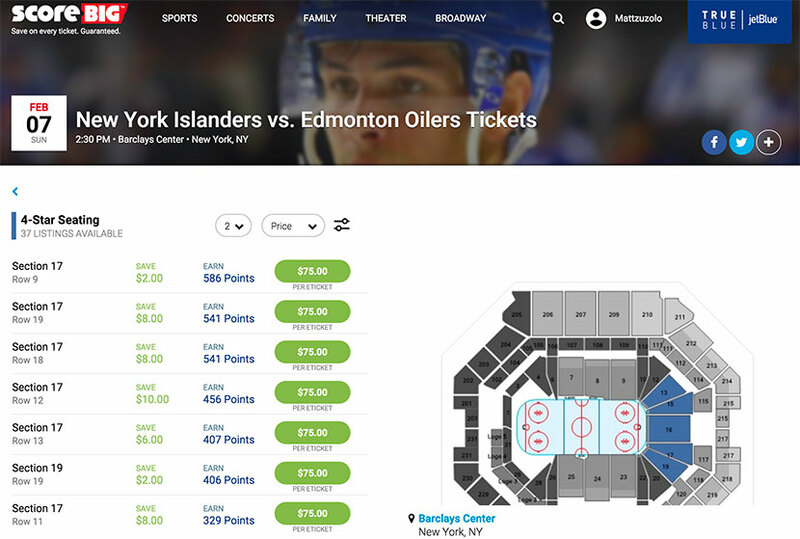 Even for this Islanders game listed above, the bonus ranges from 2 points per dollar to 4. 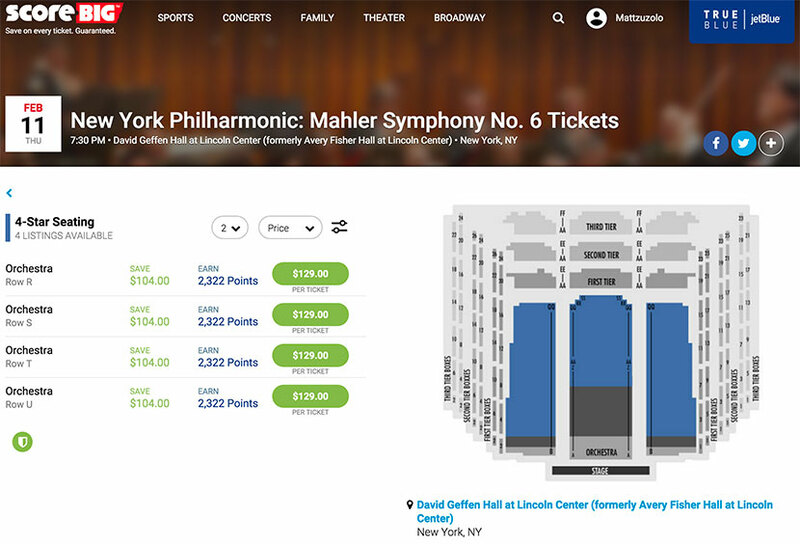 Other events, like the New York Philharmonic concert below, appear to offer the same bonus regardless of your seat selection, so in this case the amount of your reward is tied only to the ticket price. Earn 9 points per dollar on tickets to the New York Philharmonic for this concert date. TPG values TrueBlue points at 1-1.4 cents each, so you’re getting at least $23.22 in value back when purchasing the tickets above. ScoreBig already partners with other travel loyalty programs including United and Virgin America, among others. Of course you don’t need to buy event tickets to boost your TrueBlue balance quickly — you can earn points quickly by transferring points from a partner program, such as those earned with the American Express Premier Rewards Gold card. Moreover, if you’re not already a TrueBlue member, you can earn a 3,500 point sign-up bonus if you sign up and fly by March 14, 2016.